If you have a choice between playing this and eating a regurgitated Whopper, well...make the right choice. Where to start with such an amazing game? First of all let me say that my bias has nothing to do with this. I will admit that I'm a fan of the King as a mascot, I like the commercials, and Burger King food has a tendency to be delicious. 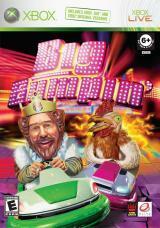 Tragically, the foray into gaming was a failure, at least for this part of the "golden trilogy" (only I call it that) of Burger King Games. Option A: Go through the menus and tutorials, making sure to know the rules and controls for each type of bumper car game. Option B: Randomly mash buttons on your Xbox controller until something happens on the screen. Option C: Calmly press the eject button on the Xbox, resisting the urge to destroy everyone and everything surrounding it, remove the game disc, then destroy any and all evidence that the game was ever in your game system or your home. If anyone saw you playing, bribe them to shut them up. Jokes aside, the game is basically unplayable. Local multiplayer is boring, Xbox live multiplayer doesn't exist because the first 0 people that tried to play online had to be admitted to a mental institution, and single player is so completely random that you might as well have your fish try to get the achievements. 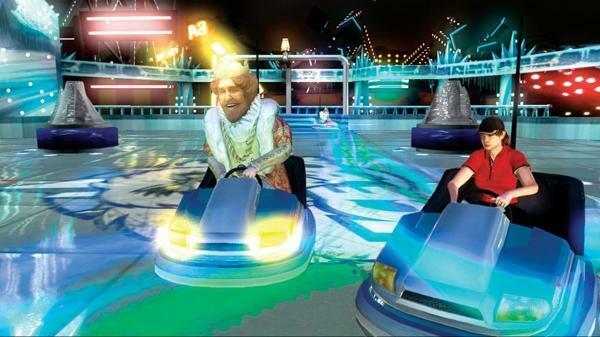 Basic gameplay consists of attempting to maneuver your amusement park bumper car to achieve various objectives, explained below. The game does look decent graphically, but is full of glitches that will randomly make your bumper car explode or fall off an edge. There are several different modes of gameplay, which would be nice if the controls were fixed. There's a hockey style game, a "hot potato" type game where you try to avoid contact with other bumper cars, and a typical "deathmatch" battle mode where you try to eliminate the other players. 92% of the item "power-ups" actually make you lose, the other 8% make your opponents win. Controlling the car itself is a crapshoot, it basically goes anywhere on the playing field, as long as that place is not where you're trying to go. One spectacular feat the creators of this game (who are surely in some sort of government identity protection program by now) managed to accomplish is an A.I. that is simultaneously the most ineptly worst possible and the smartest supercomputer ever made. In some games you can bumper your heart out and get decimated by the A.I., in others you can never press a button and win easily. Amazing. Redeeming factors: It makes Sneak King look like the best game ever made. If you play two video games in your entire life, the first being Big Bumpin' and the second being Sneak King, you will worship Sneak King as a god. To conclude, please do not buy or own this game. There are some out there that think it might be a collector's item someday, and to that I say not likely, and to be safe if you are keeping it as a collectible just don't own an Xbox to play it on.